I hope that some of you are enjoying “The Little Mouse, the Red Ripe Strawberry and the Big Hungry Bear”. I am still waiting for my large format version to arrive. I am really looking forward to having it “super-sized” for September reading with my Junior Infants! I have been a fan of Laurence Anholt for years and years. In fact I purchased this book way back in 2001 when I was training as a Montessori Directress. I still remember reading it to my first class in Slieverue. When I left one of the children gave me a packet of notelets as a gift. He had chosen them himself and the images were of Vincent Van Gogh paintings. He recognised the painting and knew that I would love them. Sweet!!! This summer one of my pupils gave me a beautiful Sunflower plant. It is looking resplendent in my garden thanks to the sunny weather that we have been experiencing. Sunflowers just brighten up any day! 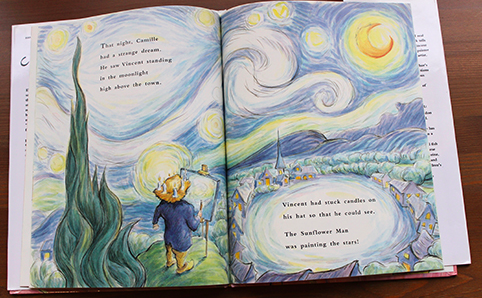 Camille and the Sunflowers explore Vincent Van Gogh’s art through the eyes of a child. Camille is fascinated with Van Gogh’s paintings, especially Starry Night and The Sunflowers. 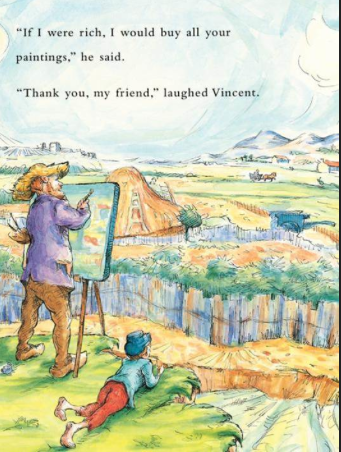 Camille accepts Vincent and his work, unlike many of those in the village. Camille and the Sunflowers is filled with reproductions of Vincent’s work. Each page is more beautiful than the next. Laurence Anholt’s books are a wonderful way to introduce your child to art and art history. The stories are captivating and the illustrations breathtaking. Children just love them! 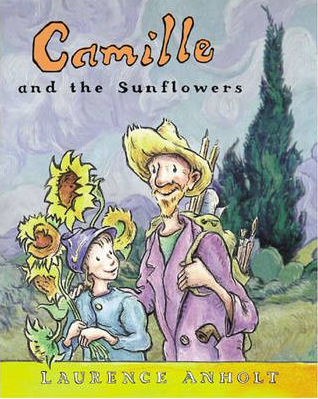 Camille and the Sunflowers is available from Book Depository for €6.05. Click here for a link. Your local library may also have a copy. I am pretty sure that mine does. Frozen Chocolate Banana Pops for a hot day!